Two exceptional and very different films are playing at the M.V. Film Center. “Burning” comes from celebrated South Korean director Lee Chang-dong; Tom Volf directs the documentary “Maria by Callas” about the celebrated soprano. “Burning,” based on a short story by Japanese author Haruki Murakami, immerses the viewer in South Korean culture. It is not a thriller in the conventional American sense, and in some ways, it plays like a horror film. As are so many Asian films, the pace is slower than what viewers are most likely used to. The triangle formed by three characters dominates the plot. The central figure is Jong-su (Ah-In Yoo), a slack-jawed, young would-be novelist who falls in love with Hae-mi (Jong-seo Jun). Ben (Steven Yeun of “The Walking Dead”) makes up the third member of the triangle. The film opens with Jong making a delivery in downtown Seoul, where he runs into Hae-mi, who is working as a hawker for a discount store. Jong doesn’t remember Hae-mi, but they both grew up on the outskirts of Paju, a city not far from Seoul and the North Korean DMZ. Working with a subtlety that grows more and more unsettling, the director drops in details or omits them in the narrative. Jong wins a woman’s watch in the raffle Hae-mi is shilling, and Jong gives it to her. Seemingly forgettable, the watch shows up again later in a more disturbing way. This initially minor exchange provides one step along the way to Hae-mi’s seduction of Jong. After a night together, she asks a smitten Jong to feed her cat while she vacations in Africa. While the cat food gets eaten and litter box used, the cat never appears for Jong. Another cat, possibly Hae-mi’s, appears later. When Jong goes to the airport to pick up Hae-mi, Ben shows up with her, and to Jong’s surprise, he finds he has a competitor for Hae-mi’s affections. Jong visits the courtroom where his father, a livestock farmer and violent man, is indicted for assaulting a police officer. The three lovers spend time together at Ben’s luxury apartment, and he drives Hae-mi around in his Porsche. The contrast between Ben’s affluence with the circumstances of Jong and Hae-mi is evident. The three also visit Jong’s farmhouse, where Ben reveals that he likes to set greenhouses on fire. The next, he says, will be near where Jong is living, but Jong never finds it. After Hae-mi disappears, Jong searches for her more and more desperately, suspecting that Ben might be involved. After that, the plot unravels into more suspense with a surprise ending. 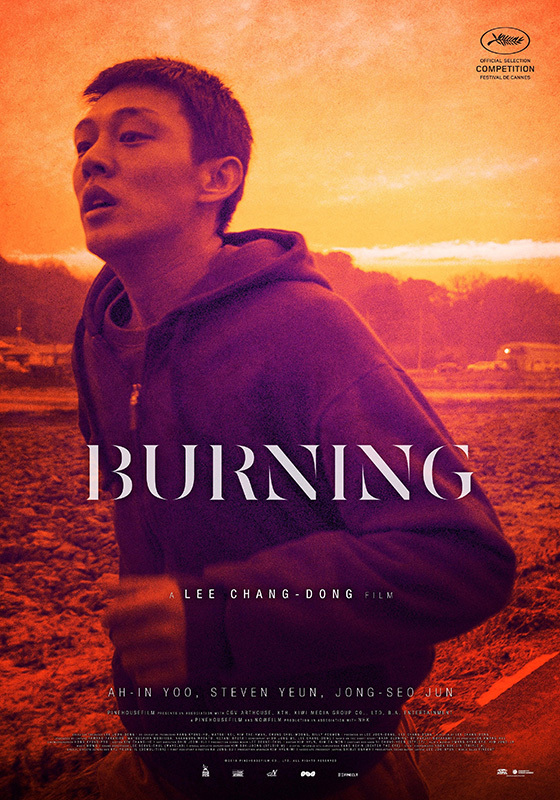 At two and a half hours, “Burning” demands patience and close attention, but the narrative and cinematography will keep the viewer involved. First-time director Tom Volf’s documentary, “Maria by Callas,” celebrates the acclaimed soprano and provides the viewer with plenty of examples of her power in her performances. He has based the film on Callas’ own words in interviews, diaries, and unpublished letters and memoirs. The diva comes across as an intelligent and insightful interpreter of her life and career rather than the tempestuous figure painted by the media. Both Callas’s mother and her husband, Giovanni Battista Meneghini, pushed her to advance her career, which led to health problems, emotional breakdowns, and performance cancellations. The most notorious canceling came at the Teatro dell’Opera di Roma after the first act of “Norma.” Although she was diagnosed with bronchitis, the press vilified her, and she never recovered from the experience. Volf lets Callas explain what happened when her Metropolitan Opera contract was canceled by Rudolph Bing. There are some clips from her childhood; the viewer learns she was born in New York into a Greek-American family and began her musical education at the age of 13 at the Athens Conservatoire. Later the film shows Callas working in Pier Paolo Pasolini’s film “Medea.” But the emphasis remains on her glorious singing and dramatic skills. Segments of the David Frost interview help tie the film together. Callas talks with Frost about how “when the public loves you so much, you need to give that much more.” The many scenes of her accepting bouquets, arriving in planes, and getting into cars act as transitions of sorts. Except for her performances, the most compelling part of the film comes near the end, when she talks about her relationship with Aristotle Onassis. After nine years with Callas, Onassis married Jacqueline Kennedy, although, according to Callas, he eventually called the marriage a mistake and returned to Callas. Because there are no voiceovers, the viewer will find gaps in her personal history. For instance, she was overweight for at least the first half of her career. As satisfying as this hagiography of the legendary soprano is, the viewer is best off pairing the film with a full biography. Callas died at 53 in 1977. Opera singer Joyce diDonato voices the sections of Callas’s diaries, letters, and memoirs. Information and tickets for these two films and others playing at the Film Center and the Capawock are available at mvfilmsociety.com.